I haven’t posted anything on here for almost a month. As you know very well, I’ve been busy–busy with various events and projects, one of which is the final revisions for my novel, which is scheduled for publication this coming fall (and is the main reason for the aforementioned pestering). In any case, I hope you’ve enjoyed your holidays and had the opportunity to rest. January 1st was not “my” new year, but having another point in time to reflect on the past year is nice. Especially since, contrary to John Oliver’s experience of 2016, I had an absolutely amazing year. Seriously. I went to update my personal website and remembered the feeling I had when I first wrote the content for it: “I have no publishing credits. I have no experience. I have no academic degree. I am a generally inferior human being.” Well, I still don’t have a degree, but screw that. I realized my lifelong dream of walking into a bookstore, seeing a book on the shelf, picking it up, and being able to say, “I wrote this.” And that was only the beginning! After 15 years of trying to publish fiction, not only did I get two short stories published and another accepted, I found a publisher for my novel. Several pieces of mine were published on well-known websites like Kveller and Aish.com. I even had a little piece accepted for publication in the print version of Writer’s Digest (to be published in the March/April issue). I am proud of what I have accomplished this year. I know you don’t feel you deserve any of the credit, but obviously, your presence in my life inspired some or most of content in several of these projects. So, thanks for existing. 😉 And even you can’t deny that you’ve helped me a great deal with both books, so thank you for that, too! Another exciting thing that happened recently, as you know, is that my sister welcomed a new baby into her family. And the rest of this post is in her honor. 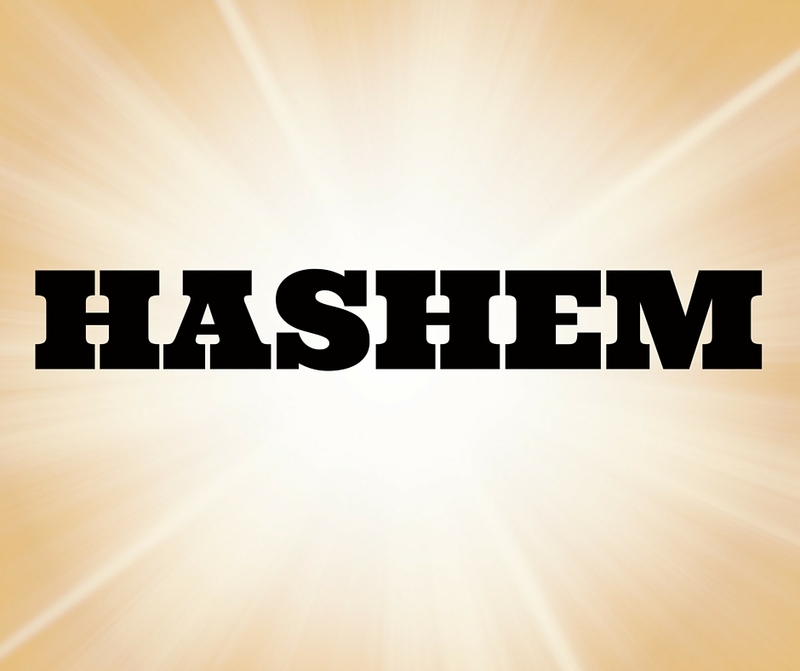 In Judaism, first names have great significance. We believe that names capture the essence of the person. Some believe that they can alter that person’s destiny. I mentioned before that it is said that parents receive a certain level of prophecy when choosing a name for their child. It’s serious business. It has always been seen as proper and beneficial to name children after relatives or important figures in the community. We hope that by having their names, our children will emulate their fine qualities. 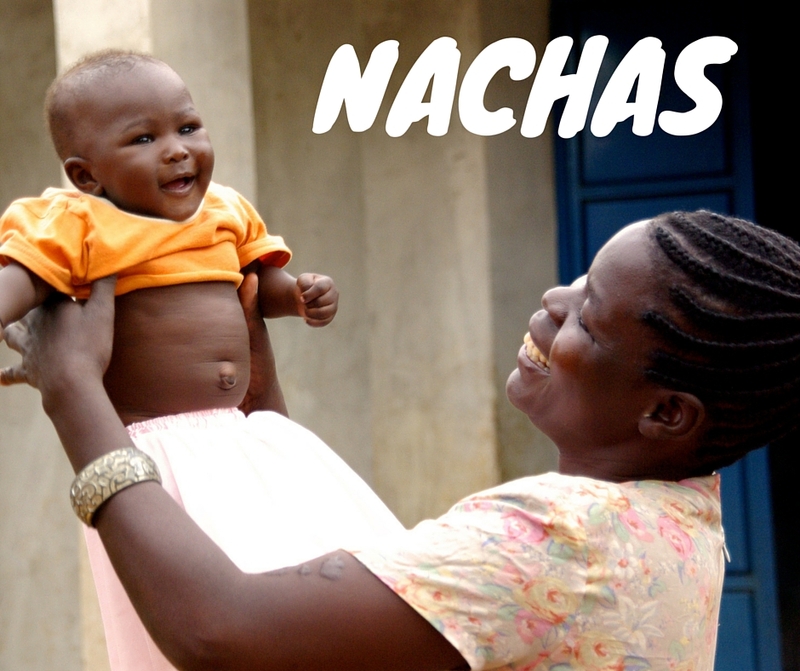 In Ashkenazi and some Sephardi cultures, there is superstition around naming children after living relatives. So we usually only name kids after deceased relatives. In some Sephardi cultures, it’s the opposite–it is a great honor to have a child in the family named after you while you are still alive. In ultra-Orthodox/haredi communities, these naming customs remain virtually unchanged. The most common names are Biblical names and/or Yiddish names, often after deceased relatives or great community leaders. Some modernized American Jews, mostly of the older generation, gave their kids both an “English name” (which they generally go by in day-to-day life and use on their legal documents) and a “Hebrew name” (used in Jewish ritual contexts, such as prayer). Americans also often have middle names that are not used day-to-day, so between the English name they use, the middle English name, and all the Hebrew names, they can end up with a lot of extra names! For example: my husband’s English name is Ethan Gabriel, and his Hebrew name is Yitzchak. He was named after his grandfather Egon, whose Hebrew name was Yitzchak, too. My husband went by Ethan for the first two decades of his life. 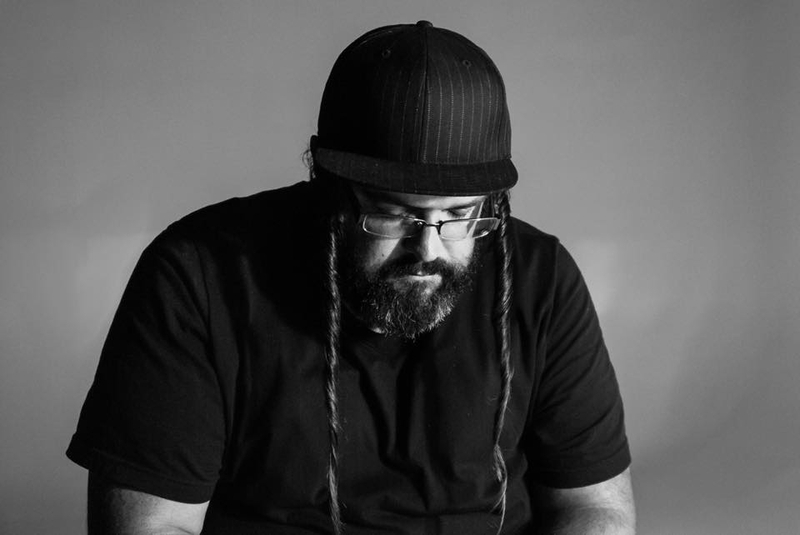 When he became religious, he changed it to the original Hebrew version of Ethan (Eitan), and added that to the beginning of his Hebrew name. But then his mother told him they’d actually named him after all three of his deceased great-grandfathers, giving him three Hebrew names at his circumcision ceremony: Yitzchak Avraham Haim! So now his Hebrew name is Eitan Yitzchak Avraham Haim. Quite a mouthful! My parents also have two English names and three Hebrew/Yiddish names each (!). I think they decided to simplify matters with their own kids. So I “only” have two names, that work in both languages: Daniella Naomi. During the early years of the Zionist movement, pioneers were eager to shed their Diaspora identity. They preferred to name their children distinctly Hebrew names rather than Yiddish ones. 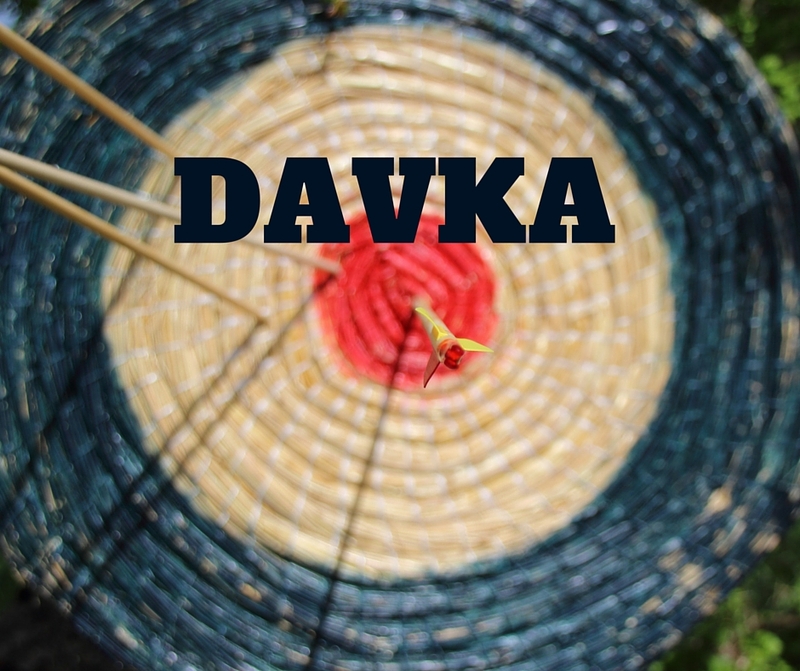 They continued to use the classical Biblical names like David, Sarah, Yosef, and Tamar (all of which are still on the top 10 list of given Jewish names in Israel), but they also started giving modern Hebrew names like Rotem (a kind of flower), Shira (“song”), and Tal (“dew”). In the religious community, modern Hebrew names have a more religious bent, such as Shirel (“song of God”) or Benaya (“God has built”). As you may remember, all my kids’ names are in the latter category. 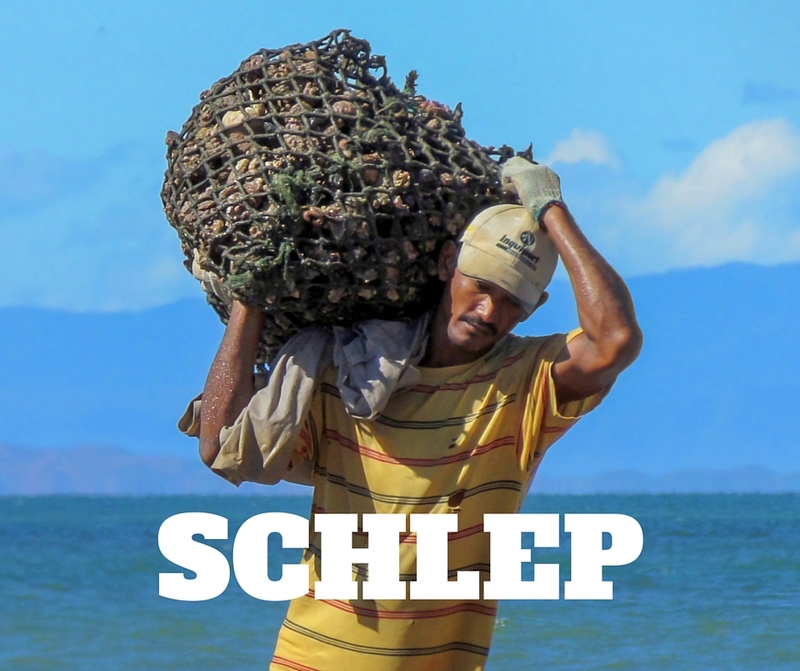 They are modern names, but heavily anchored in Biblical texts. Their names were all inspired by those of a deceased person we wanted to honor. My sister wanted to name my niece after our grandmother. But the English name has a negative Hebrew meaning, and the Hebrew name was kind of antiquated. So we tossed around ideas for names with similar sounds and meanings, fretting over spellings and pronunciation, until she eventually chose one. The name she settled on also happens to associated with the holiday of Chanukah. My niece was born on the fifth night. This amount of thought going into a name is totally 100% normal to me, and it only occurred to me recently that it might be very strange to other people. Just as it is completely bizarre to me that names like “Jayden” that don’t mean anything are so popular in the USA. Why would someone give their kid a name that’s just a bunch of sounds put together?! Nothing could be farther from the truth!!! There is actually a requirement in Jewish law that couples be unclothed during relations. My bridal counselor taught me this and I have read it in several sources. And even if that weren’t true, there is absolutely no need for “modesty” of this kind in the context of a sexual relationship within marriage. Marital relations are supposed to be an expression of ultimate intimacy. There is a theory that this myth came about because of the tallit katan, the four cornered garment that men wear with the tzitzit (tassels) at each corner. 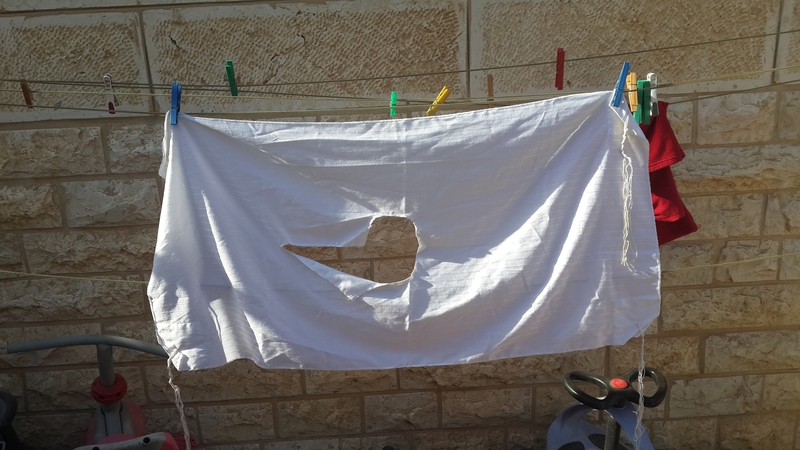 It looks kind of like a small sheet with a hole in the middle, and maybe people saw it hanging on Jewish clotheslines and drew this stupid conclusion. Okay first off let me point out the obvious absurdity of this myth. Do you think this guy wouldn’t be buried in a Jewish cemetery because of his tattoo? The biblical prohibition in Leviticus 19:28 is not against having a tattoo, it’s against getting/giving yourself one. And it’s not as clear cut as you may think. The context of the prohibition is clear: the tattoos that were prohibited were a very specific kind with a specific purpose–something to do with idolatry and commemoration of the dead. It is not at all clear that aesthetic tattoos are included in this prohibition. This has practical implications: most rabbis agree that it is permissible for a woman recovering from breast cancer to have reconstructive surgery including a tattooed areola. It is true that most rabbis agree that aesthetic tattoos (except in cases like the above) are forbidden. But just because you violated Shabbat or ate pork doesn’t mean you can’t be buried in a Jewish cemetery–and getting a tattoo is lower on the hierarchy than those prohibitions. Having ink under your skin doesn’t inherently “taint” you or something. So what’s the origin of this myth? 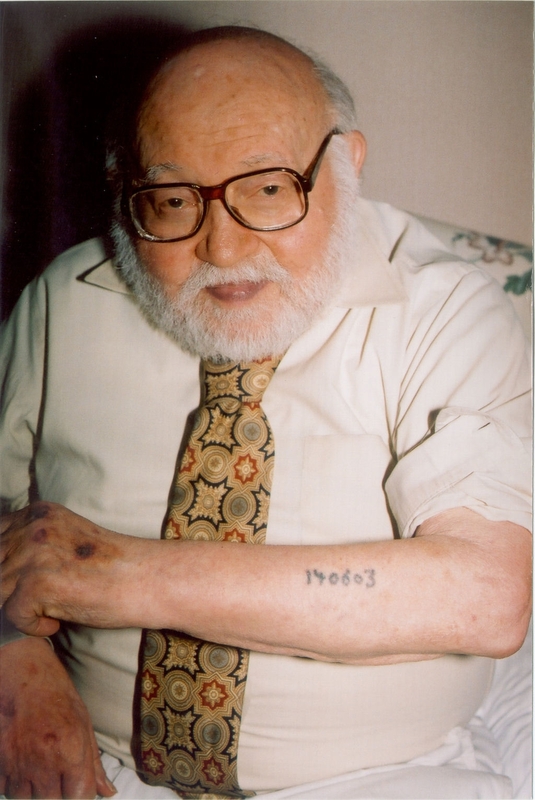 Eitan heard a theory that maybe it was because during the Middle Ages, when an unidentified body was found and they were trying to figure out where to bury it, it was known that if it had a tattoo, it couldn’t have been Jewish, because Jews don’t get tattoos. So unidentified bodies with tattoos were never buried in Jewish cemeteries. To be fair, this one at least has some basis in fact: in some Hassidic circles, women do shave their heads after getting married, to make it easier to wear a wig. But the vast majority of Orthodox Jewish women do not shave their heads. I assure you, I have a full head of hair under there. Oh. My gosh. This one drives me nuts. As we have discussed (and by “discussed” I mean I ranted at you for a full five minutes and then wrote a long essay on the topic for this blog eight years later), kashering dishes and cookware is complicated and generally involves some kind of heating or boiling. So where on earth did this burying thing come from? And yet time and again I have heard uninformed Jews refer to burying as the proper way to kasher things–or just some bizarre ritual to get rid of the “treifed” (un-koshered) utensil. At first I thought this was an “assimilated American Jew” thing, but then a friend told me that her Moroccan-Israeli roommate had a flowerpot full of forks and spoons waiting to be kashered! There is no basis whatsoever for this practice!!! It’s probably the result of a weird conflation of the aforementioned scraping-to-get-it-clean thing with the fact that we’re supposed to leave a utensil unused for 24 hours before kashering it. Only Larry David would have the chutzpah to make an entire episode about Orthodox Jews without bothering to consult one. …Actually… no, he’s not the only one. It’s a truly beautiful scene that captures a lot of the spirit of Sabbath Eve… but… this is almost certainly not what a Friday night looked like in a Russian shtetl in the early 20th century. In this clip it seems that they are lighting the candles before sunset, and then sitting down for the meal. More likely, the mother would light the candles, and then the men would head off to synagogue for evening services. When they got back home after dark, they would have the meal by the light of the already-lit candles. Lighting candles before Shabbat is a well-known and popular custom that was instituted by the rabbis. It is not a Biblical requirement in any sense. But there’s a common misconception that they must be lit right before the meal–even if the meal takes place, as it usually does, after sundown. I’ve seen this happen in other movies and TV shows about Orthodox Jews, and it drives me crazy! The prohibition against lighting fire on the Sabbath is one of the few Sabbath prohibitions that is explicit in the text of the Bible: “You shall not kindle fire in any of your dwelling places on the Sabbath day” (Exodus 35:3) An Orthodox Jew would never ever ever ever light candles at the Sabbath meal if it started after sundown. A) The only clear-cut prohibition we have regarding pigs is not eating them. We are allowed to use any part of them for any other purpose. I think this misconception comes from a basic lack of understanding about Judaism and Jewish law… and the fact that Muslims are a lot more strict about pigs and pig products than we are. Muslims are not allowed to touch pigs and see them as having an inherent impurity. Jewish culture does share a cultural bias against pigs, however, and especially Chabadniks, who take particular issue with non-kosher animals including dogs and cats, might feel uncomfortable with the idea of a porcine implant. But what should have happened in the above scene is that once they told this young woman she would die if she didn’t get the implant, she’d have picked up the phone and called her rabbi, who would have told her that it’s fine. Unlike the previous two this one usually comes from non-Jews who have heard that there is some weird thing about Jews and food but have no idea what it is, and draw the conclusion that the food needs to be “blessed” by a clergyman. As I have exhaustively explained, kashrut has nothing to do with whether it was blessed by a rabbi, and everything to do with the contents of the actual food–kind of like a spiritual allergy. In cases of packaged or prepared foods, we do require supervision by a rabbi–that is, that a rabbi verifies that the product has been prepared in accordance with the laws of kashrut. Actually, we “bless” our own food. That is, we recite a blessing before taking a bite of anything. But that has nothing to do with kashrut. I elaborated on that here. Just… wanted to clear that up. Nine years later, I have finally given you a solution: a new one! Why Do We Wear Things on Our Heads At All? Wearing a kippah regularly is not a Torah obligation; in fact, it’s hardly even a rabbinic obligation, except when studying Torah or praying. The Sages decreed it necessary to cover one’s head in those contexts, to encourage humility before God. But it became a very strong and virtually universal Ashkenazi custom for men to cover their heads at all times. (In some Sephardi communities, this custom was never adopted, and men only cover their heads for prayer and Torah study.) 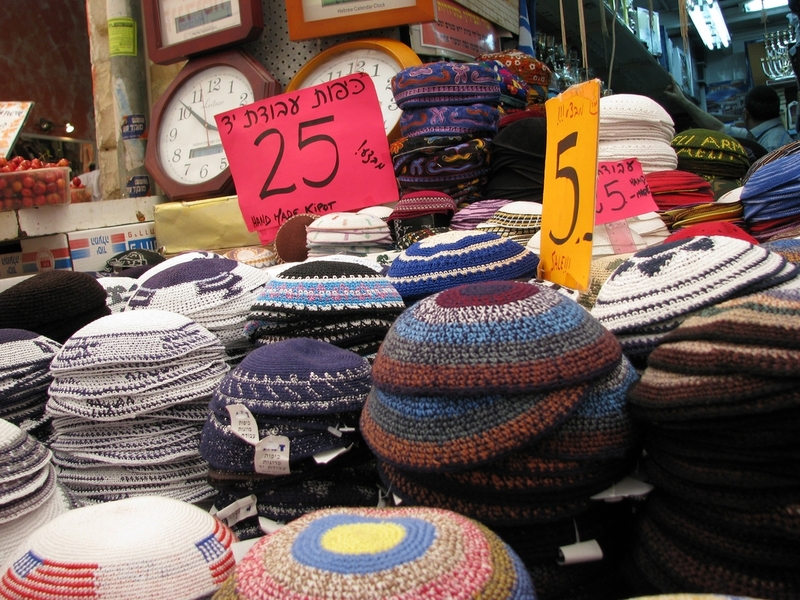 It doesn’t have to be with a kippah; it could be a hat, or a cloth, or a napkin, or a flowerpot. (Okay, I’m not sure about the flowerpot.) The point is that the head must be covered. So what about women? First, we have to differentiate between two separate issues here. There’s covering one’s head, and covering one’s hair. 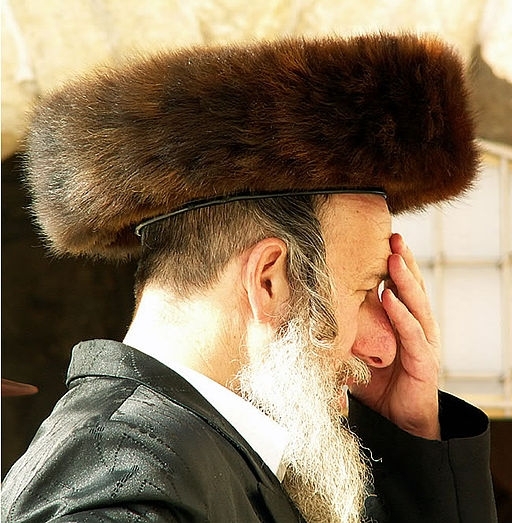 Covering our heads falls under the same category as the kippah, and theoretically, we should all be obligated to cover our heads when studying Torah or praying. But since unmarried Jewish women tended not to cover their hair, the custom of covering their heads eventually faded, and in Ashkenazi communities it is generally not expected of young women to cover their heads in those contexts. Sephardi custom, however, maintained that women must cover their heads while praying or studying Torah until very recently, when they were influenced by the Ashkenazim. The late Rabbi Ovadiah Yosef (may his memory be for a blessing) tried to reestablish that custom in Sephardi girls’ schools in Israel. So that’s head covering. Hair covering is a different story altogether. Most halakhic authorities maintain that married Jewish women must cover their hair as part of our customs regarding modesty. They link it to a passage in the Bible, which gives it a lot more weight than the head-covering thing. 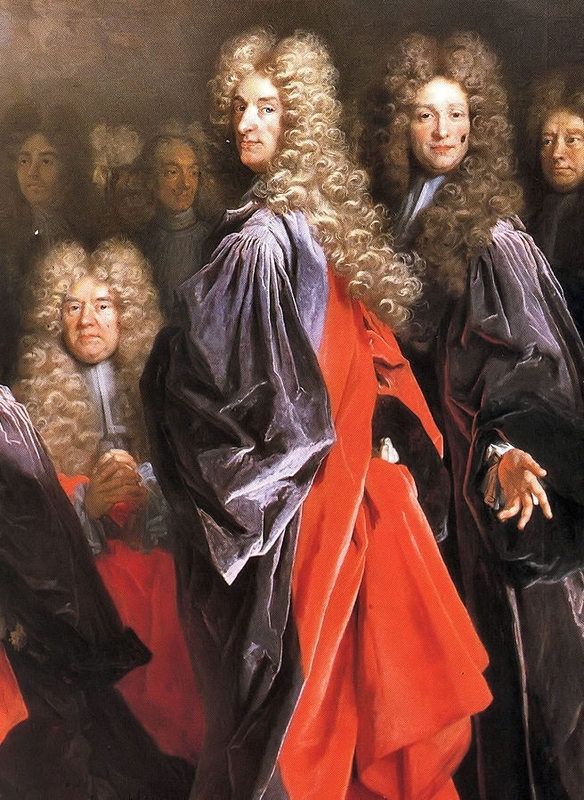 I took a class on this once and it’s a very complicated issue, but in short, there is a wide variety of opinions on how much hair needs to be covered. In some old-school American Orthodox families the women do not cover their hair, but today most religious women do cover their hair to some degree. Historically, unmarried women may have covered their hair too, but today it is universally accepted that unmarried women don’t cover their hair. 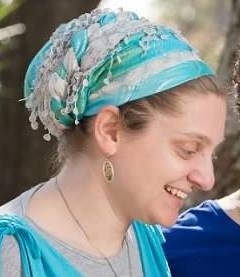 Note that this is one different between Jewish women’s hair coverings and the Muslim practice of wearing a hijab. The hijab is worn when the young woman hits puberty, regardless of whether she is married. Also known as a yarmulke in Yiddish, this is the little dome-shaped cap that most religious Jews wear. More than a cap to fulfill the head covering requirement mentioned above, the kippah has become a statement, a declaration that the wearer is a religious Jew. 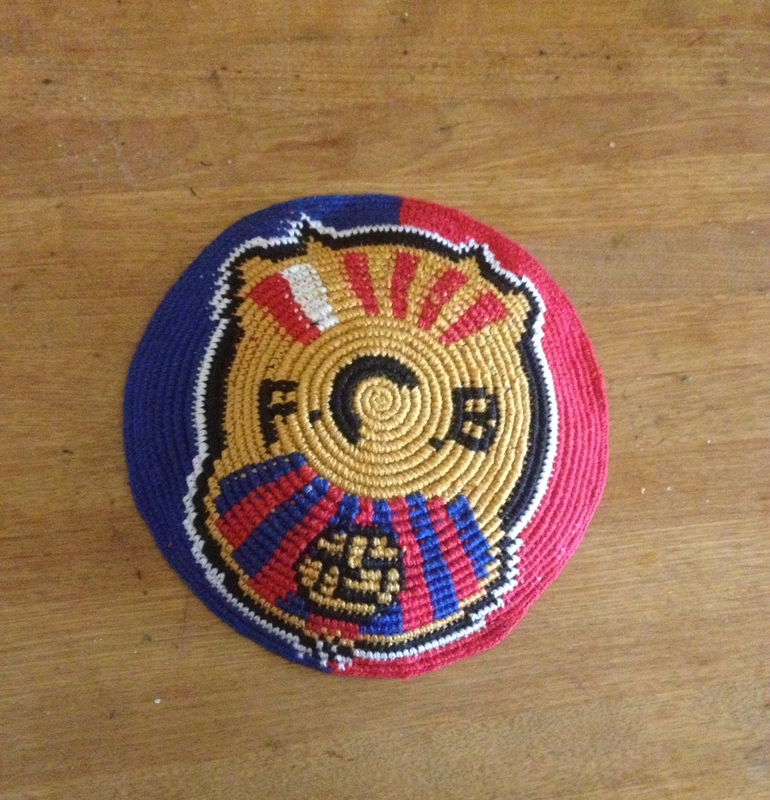 As you saw yourself, there are many different styles and types, from the crocheted ones (like your FCB one above) worn by the modern Orthodox to the black velvet ones worn by the ultra-Orthodox, from the leather ones associated with American Jews to the highly decorative embroidered caps associated with Bukharan Jews. 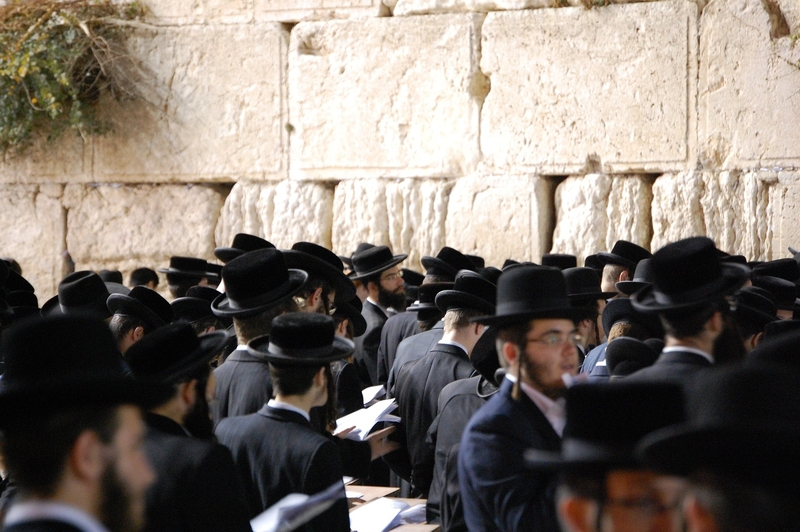 The term “black hat” has become a way to identify a certain stream of Judaism–usually ultra-Orthodox or Hassidic. It tends to be part of the black and white “uniform” worn by most ultra-Orthodox men, which reflects the clothing worn by the noble class in 17th century Poland. These come in a variety of shapes, but they are usually round with a medium-wide brim. Jewish men who wear these black hats usually wear a black velvet kippah underneath it. This is the furry round hat certain streams of Hassidim wear on Shabbat and special occasions, once again based on the clothing of the nobility in 17th-century Eastern Europe. Shimon in his pinstripe flat brim ocho, and yes, those are his real payot. Photo taken by his amazing wife, photographer Mandy Detwiler; you can view more of her work on her FB page here. 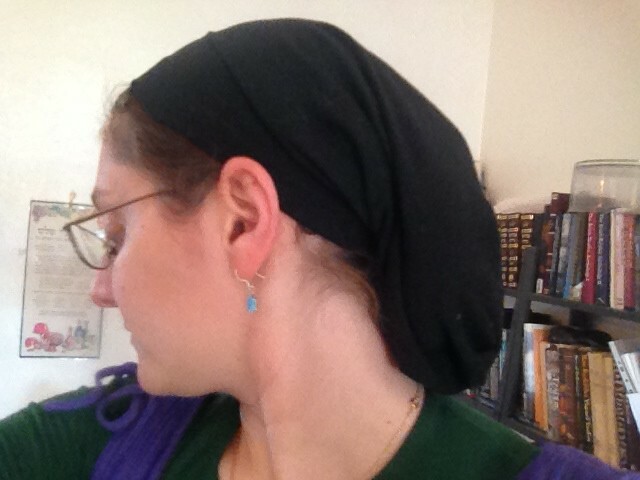 “Tichel” (that’s “tikhl”) is Yiddish, and “mitpaḥat” is Hebrew, and they both mean “scarf.” This is what I usually wear. There is a wide variety of types and shapes and ways to tie them, from oblong rectangle scarves to square scarves folded into triangles to pre-sewn “apron scarves” that achieve the many-layered look without requiring an obscene amount of bulk and wrapping and matching. As you can imagine, some ladies have this down to an art. See, for example, the Wrapunzel website. 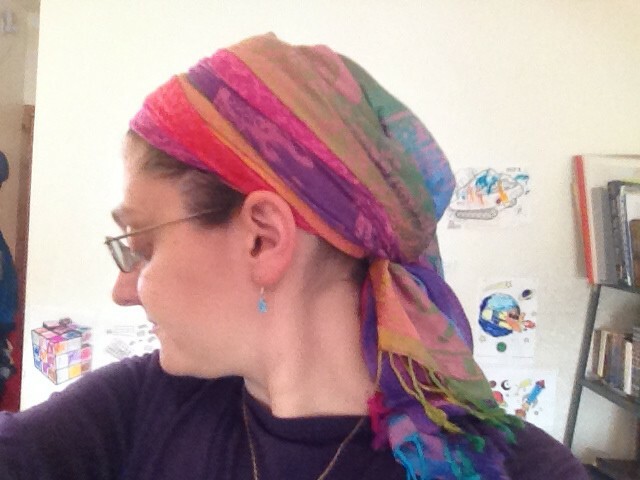 The style I’ve been favoring lately: a single Pashmina scarf wrapped around and tied in back. Me in a fancier multi-scarf wrap. The modesty standards of Islam require that a woman cover all (or most) of her hair and her neck. Judaism is more lenient than this. If you can see the woman’s neck, it’s probably a tichel. If it wraps all the way around her face and hides her neck, it’s probably a hijab. …I know. Why would you cover your hair–for modesty’s sake–with something that looks exactly like your hair? Well, frankly, that’s why I don’t wear them. 😉 But it’s actually a lot more widespread in the ultra-Orthodox world than in the modern Orthodox one, mostly for societal reasons. You see, when the question was first asked if it was permissible to cover one’s hair with a wig, wigs didn’t really resemble natural hair. One might argue that these things resemble nothing found in nature. Therefore it was ruled that there was no problem. As wigs became more and more realistic, the question was revisited, and most rabbis agree that covering one’s hair is a more complex question of modesty than, say, covering one’s knees; after all, if it was immodest to show one’s hair, why should it be okay for unmarried women to do so? Therefore they concluded that it’s more of a mystical issue than a practical one pertaining to modesty, and the important thing is that the natural hair be covered–even if someone looking at the woman can’t tell that that’s the case. Furthermore, many ultra-Orthodox rabbis feel that wigs are preferable because it’s much easier for a woman to cover all of her hair with one than with a scarf. 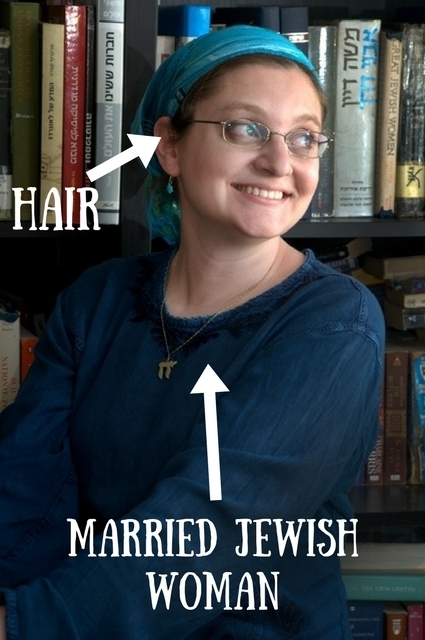 (Most modern Orthodox rabbis hold that married women can show a certain amount of hair in the front, which is why you can see some of mine in the pictures above.) They also argue that women are more likely to cover their hair if they can cover it with a wig, because covering it with something else makes them stand out. And I can certainly testify that there is something to this. Every time I go back to the USA I feel more and more like an alien from outer space with my covered hair and long skirts. People are polite about it, but it draws a lot of attention, and it’s exhausting. Sheitels are much more common in the USA than they are in Israel for that reason, even among those who consider themselves modern Orthodox. 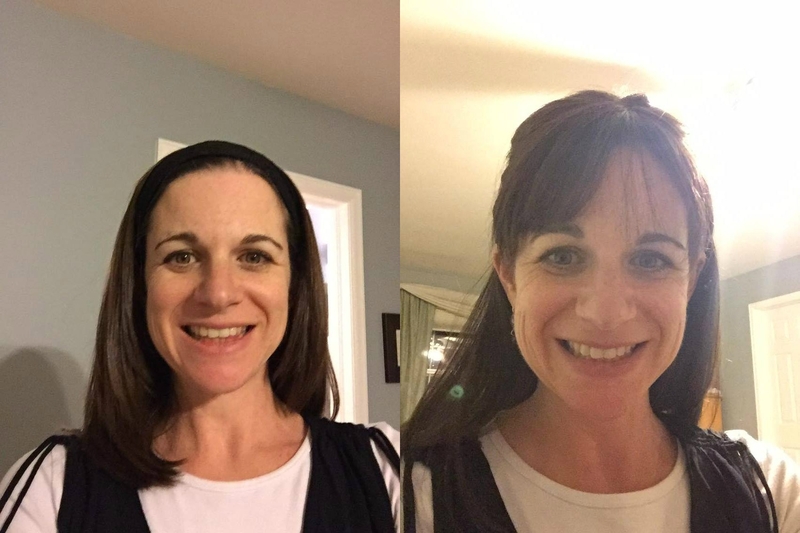 This is Deborah, a friend of my in-laws’ from Denver, who was kind enough to send me these photos of her in her sheitels. The one on the left is called a “fall”, which is held in place by a headband, and the one on the right is a full wig. Some ultra-Orthodox rabbis also maintain that there is a maximum length that is permissible (usually down to the woman’s chin). In contrast, the Lubavitcher rebbe, leader of the Chabad Hassidic stream (described here), asserted that women should wear long, luxurious wigs so they will get enjoyment out of this mitzvah and feel beautiful. Obviously, another option for covering one’s hair would be a hat. 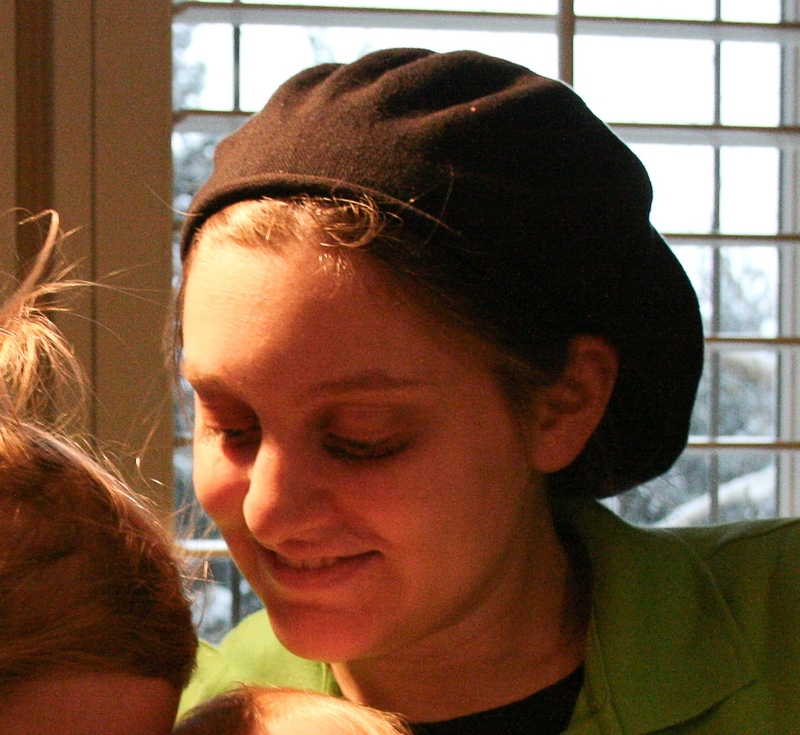 Berets are very popular because they are comfortable and super easy to put on. Just stuff your hair in and you’re good to go. They’re what I wear when I’m in a rush and can’t be bothered with all the wrapping and hair clips and whatnot. Fancier, more formal hats are also worn, but they tend to be associated with the older generation; it’s the fancy scarves that are most fashionable among young women today. On the most casual end of the spectrum is a very curious hat known as the snood. The only time I ever wore this in public was when traveling. You try sitting on an airplane for 11 hours with one of those multi-scarf contraptions on your head. They may look kind of odd but they are certainly the most comfortable of all the options, especially for those of us with long hair. Many women, especially ultra-Orthodox women, choose to wear them around the house or in other casual settings. Much as you and I are kindred spirits, and much as our friendship has defied significant distances over space, time, language, culture, religion, and lifestyle (to name a few! ), those gaps do sometimes cause confusion and frustration. It was when I began writing to you regularly that I noticed that it was not just you who was struggling to communicate in English. My normal way of expressing myself–in general, but particularly when I was talking about Judaism–included a surprising amount of words from other languages. Mostly Hebrew and Yiddish, but also Aramaic and even Arabic. I hadn’t even realized how often I used these words and phrases until I found myself constantly translating myself for you. It was only recently that I realized that this is because my mother tongue is not actually English. You see, I recently read a book called “The Languages of the Jews: A Sociolinguistic History” by Professor Bernard Spolsky. (Well, of course I did. History, Judaism, and linguistics all in one academic volume?! Yes please!!!) The book explores the usage of various languages by Jews throughout history, and you can imagine that this is a vast and fascinating topic. We are unique in that we have lived among many, many different cultures and acquired hundreds of different languages, and yet, through much of history, we lived in groups that were distinct from the native population. So our exposure to the languages of our neighbors was somewhat limited, and our most intense contact was with other Jews, with whom we maintained a working knowledge of the languages in which we prayed and studied–Hebrew and Aramaic. These conditions created a unique phenomenon: Jews developed their own variety of the languages of our “host” cultures. Sometimes this variety was not much different from the “host” language–just a few words and phrases from Hebrew and Aramaic thrown in. But sometimes it became a dialect with its own grammar and syntax, or indeed a language of its own. The most well-known of these languages are, of course, Yiddish, and the varieties of Judeo-Spanish known as Ladino, Judezmo, or Haketia. But Jews developed their own variety of almost every language they spoke–from Judeo-Greek to Judeo-Arabic to… yes, Judeo-Catalan. Now… I am a fifth-generation American Jew, descended from Yiddish-speaking Jews from Eastern Europe. But the influences on my linguistic tendencies were not only my heritage: I also grew up in a religious community, where the vernacular tends to include a lot more Hebrew and Yiddish because we spend a lot more time discussing the traditional texts, using the languages our teachers and their teachers used. Given that the vast majority of anglophone Jews are of Ashkenazi origin and their ancestors’ mother tongue was Yiddish, it is Yiddish that has the strongest influence on Judeo-English. This website, Jewish-Languages.org, is a great resource about Jewish languages, and it has an almost 1,000-word lexicon of “Jewish English” words. 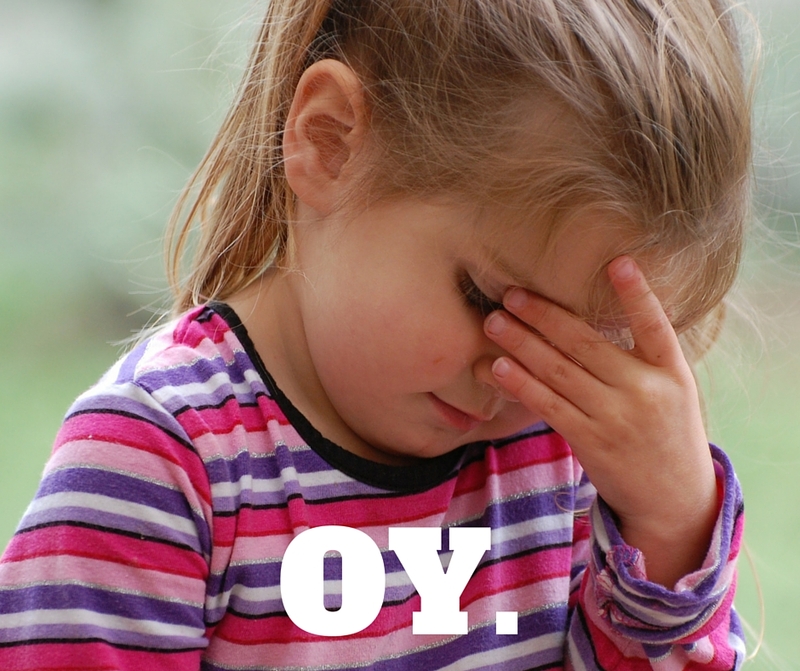 There is a joke among Anglos that when you make aliyah, you don’t become bilingual, you become semi-lingual. You acquire Hebrew words and phrases for everyday things, neglecting them in your mother tongue, and eventually find that you can no longer speak one language without the other! This is what religious Jews call God. It literally means “The Name” in Hebrew, because we are not allowed to say His name(s) except in specific contexts. The following expressions mean the same, just more emphasized: Oy vey! Oy vey zmir! Oy gevald! This is my absolute favorite Yiddish word. It expresses so much about quintessential Ashkenazi Jewish culture (and the Israeli culture that was built on it–which currently employs the word with just as much gusto). Impatience, irony, warmth, humor, chutzpah (see below! ), a little suffering, a little triumph… all packed into one short syllable. Negative chutzpah is acting shamelessly and brazenly in the name of your own selfish interests. Positive chutzpah is acting shamelessly and brazenly for ultimate good. (Sometimes the line between the two can get blurry…) Earlier this week I posted about Matisyahu’s performance in Valencia; to me, that is an example of positive chutzpah. Matisyahu had the nerve to get up on a stage in front of the BDS protesters and sing about Jerusalem as the eternal capital of the Jews. 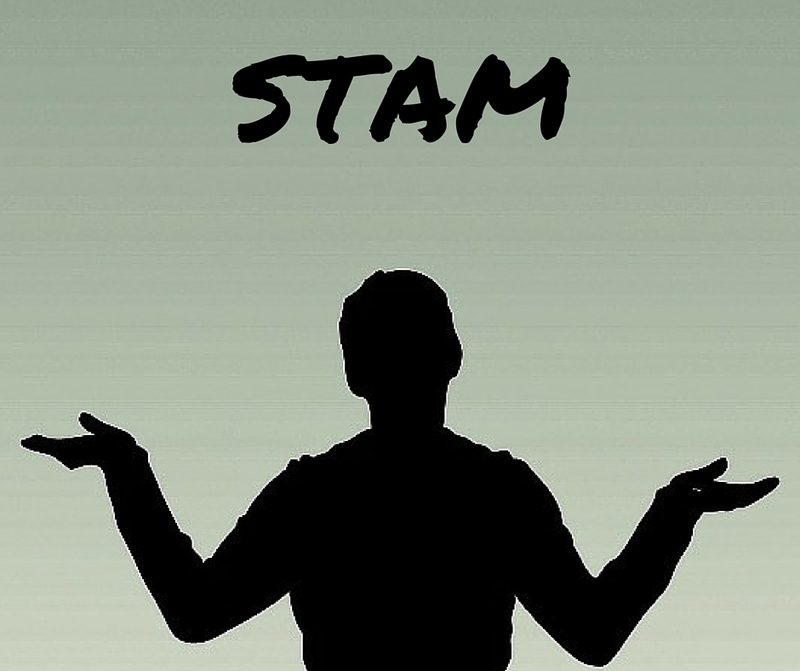 The author of the book “Start-Up Nation” argued that it is Israeli chutzpah that makes the country such a fertile ground for innovation and bold new ideas, because Israelis don’t take anything on authority, and challenging leaders and managers is part of the culture (which people from other cultures–such as your own–may find shockingly arrogant and obnoxious). And really… if you think about it, what do you call surviving and thriving over 2,000 years of exile and persecution, surrounded by nations that wanted nothing more than for you to disappear? What do you call returning to your homeland in an unprecedented historical phenomenon that still has historians and philosophers scratching their heads? What do you call secretly maintaining your Judaism under the eyes of the Inquisition only to return to that tradition after 500 years? 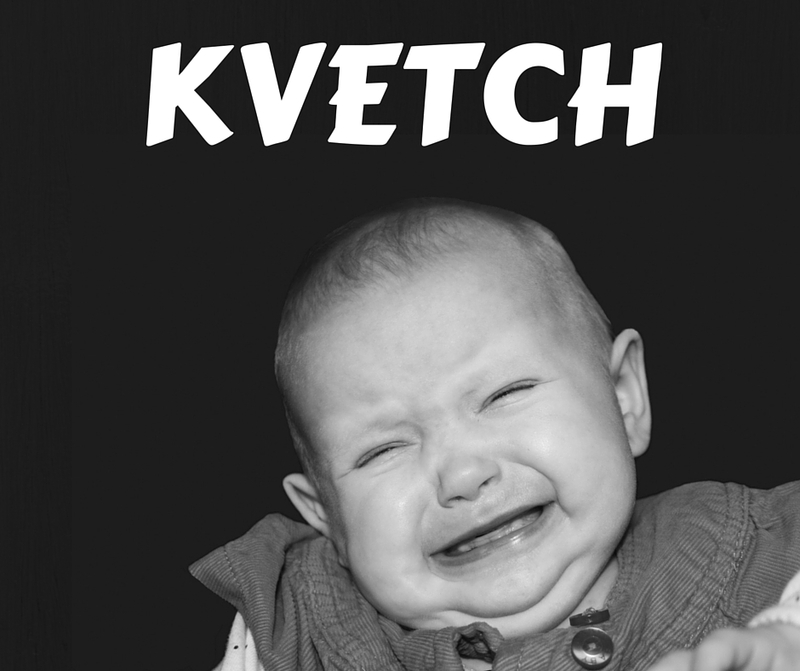 Another very important Yiddish word! This one means “complain.” And it is important because it is the #1 Jewish mechanism for coping with adversity. 😛 (#2 is dark humor, remember?) We’ve been doing it since time immemorial. See Exodus 15:11, for starters… “Were there no graves in Egypt that you brought us here to die? !” Sarcasm, chutzpah, and kvetching, all in one, and we hadn’t even crossed the Red Sea yet! Dear blog readers: obviously, I had to sift through quite a list of words and phrases to come up with my top ten, and I’m sure you other Judeo-English speakers will hotly dispute my choices. (Two Jews, three opinions, and all. 😉 ) Feel free to comment with more “Jewish words” without which you find it hard to express yourself! Greetings and welcome to Letters to Josep! Have a kosher lemonade and make yourself at home! 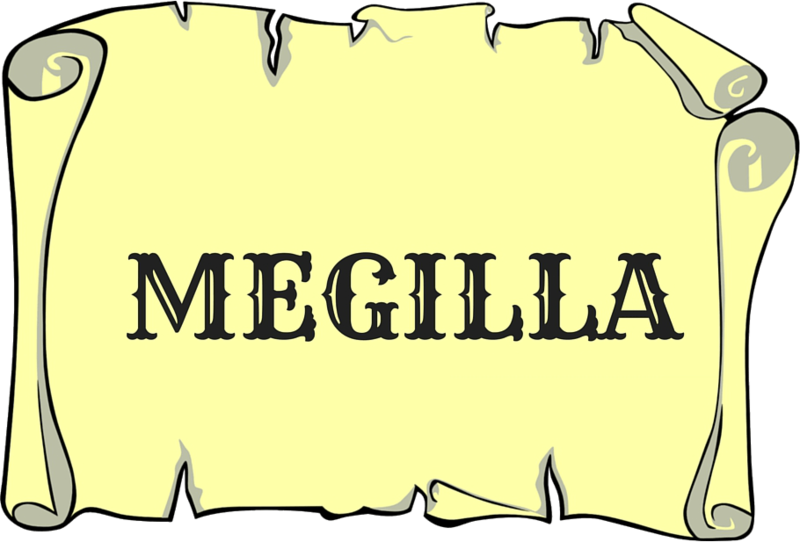 Lots of people have discovered my blog by landing on this page. If you arrived here–as so many have before you–by Googling the eternal question “why are Jews so weird,” allow me to point you to this post, where I address that question directly. If you were looking for more general information about Jewish traditions (strange customs, stuff Jews can and can’t do, etc) and what the Jewish faith is all about: the bad news is, the following post only offers a very narrow slice of that. The good news is, this entire blog is dedicated to answering that question! And the even better news is that I compiled my posts on all the basics of Judaism into a book, which you can buy on Amazon here (on Kindle or in print). It’s got all the info organized neatly for ya and it’s in the same entertaining style as the post below. So if you enjoy this post, don’t forget to check out the book! But, you know, most of that stuff is just part of our religious practice. All religions have practices that look weird to outsiders. This, however, is a list of 15 strange things Jews tend to do that are not necessarily part of religious practice. Some of them are customs (and I tried to pick ones that are common to most Jewish ethnic groups); some, a result of religious practices; some, a result of historical and sociological circumstances; and some… well, darned if we know! As I explained in a previous post, shattering glass has a strong association with the celebration of weddings in our culture. So it is almost an instinct that when someone drops a dish or a glass and it breaks, we clap and say “mazel tov!” (“Congratulations!”) Eitan was once the only Orthodox Jew present when a waitress in an Israeli hotel dropped a dish, and therefore the only one clapping and saying “mazal tov.” A Christian British gentleman nearby was deeply scandalized by this behavior and told him off for being disrespectful and mocking the waitress. He turned a deaf ear on Eitan’s attempt to explain that it was a local custom. No, this is not a board game or an educational TV show. 😛 It is a sort of ritual that naturally occurs when Jews meet each other. It involves asking the other Jew where s/he is from, and based on that information, throwing out names of people you might both know. You see, throughout history Jews have maintained close ties with their brethren in communities throughout the world. We have always acted like one big [argumentative] family. 😉 So when we meet someone new, it is almost instinctive to try to find friends in common. And the difference between Jewish geography and other, similar “where are you from?” conversations among gentiles, is that it is actually very, very likely that no matter who we are speaking to, we will find at least one person in common. Two examples from the past couple weeks alone: my father-in-law was at the mall with my kids, and as they played in the play area he noticed a woman speaking English with her daughter and grandkids. They eventually started talking, and within a few minutes figured out that she knew me as a child back in Pittsburgh and was the mom of one of my former classmates. A few days later, I got a sweet note through the contact form of this blog from someone who stumbled across it by Googling something, and wanted to let me know how much she enjoys it. Things like that make my day, so I wrote back to thank her for taking the time to write and asked her a little about herself. Turns out, she, too, is connected to the Jewish community in Pittsburgh, and lives within walking distance of my house of 18.5 years ago. What are the chances?! The story goes that Eitan’s grandfather celebrated his bar mitzvah by reading the Torah during the services on a weekday; all the adults then knocked back a shot of whiskey and headed off to work. L’chaim! All right everybody, have a great day at work. You’d think that with this nonchalance about drinking, alcoholism would be rampant. But actually, social science research indicates that Jews tend to have lower alcoholism rates than the majority cultures in the West. That isn’t to say there is no alcoholism in Jewish communities; members of my own extended family struggled with it. Still, sociologists have been struck by the paradox that Jews seem to drink much more regularly than their non-Jewish counterparts and yet suffer fewer problems due to alcohol. 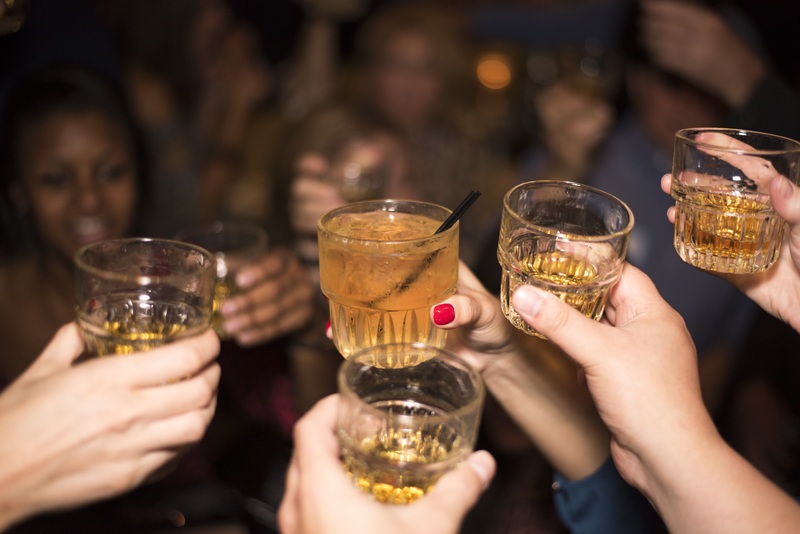 Researchers theorize that the “prescriptive” nature of drinking in Jewish culture provides Jewish drinkers with clear guidelines and limits that effectively regulate and constrain their drinking behavior. This is called “shuckling” from the Yiddish word for “shaking.” It’s a kind of meditative movement, a swaying forward and back (or side to side) that Jews have been doing while praying or studying since at least the eighth century and possibly since the time of the Talmud. You may have noticed people doing this during the silent prayer of the Sabbath services you attended. It is said to increase concentration and emotional intensity. Once you get used to it, you start doing it unconsciously, and it feels weird to pray while standing still. The sun is low and the time for minḥa, the afternoon prayer, is fast coming to a close. The men are gathered in a synagogue, or a street corner, or wherever, checking their watches. There are only nine of them. They need one more guy to complete a minyan (prayer quorum); otherwise they’ll have to pray as though they are on their own, less than ideal in halakhic terms. So they send somebody out to scan the streets for a head with a kippah on it. In Israel, of course, this is a much easier task, and in a pinch, you can probably find a kippah-less traditional Jew who is grudgingly willing to join you. 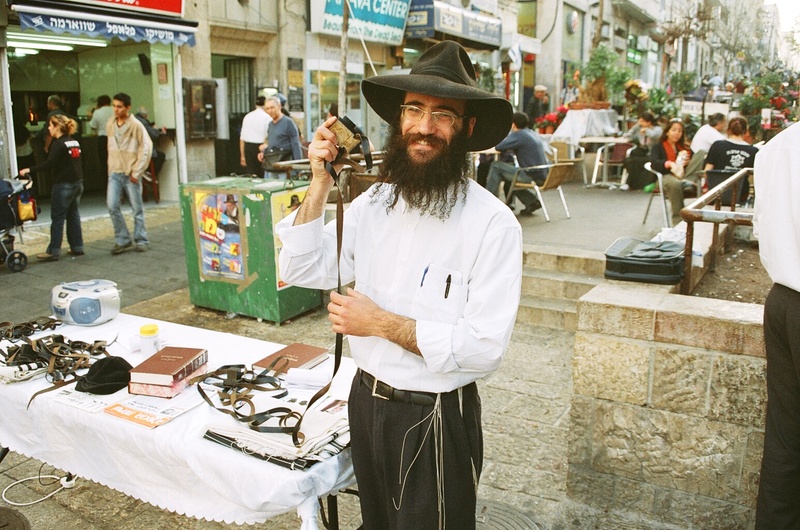 “Israel 3 009.Religious Jew on a Daily-Market” by Daniel Maleck Lewy – Own work. Licensed under CC BY-SA 3.0 via Commons. So remember how Jews have to wait a certain period of time between eating meat and eating milk? The amount of time ranges from one hour (those lucky Dutch Sephardi devils!) to six hours, and the majority of Jews–Ashkenazi and Sephardi alike–keep at least five hours. (I am super lucky and married a man who keeps three, so I got to take on his custom! Mwahaha!) Fleishik is the Yiddish adjective to describe a food that is considered meat. But when someone says “I’m fleishik,” he is not saying that he cannot be consumed with béchamel sauce, but rather that he has eaten meat recently and cannot yet eat dairy. You’ve heard of hugging trees, and now…..
Never putting them on a chair, bench or couch when someone is sitting on it. Never bringing them into the bathroom. Never putting other objects or books on top of them. And there’s a “hierarchy” of holy books which may be placed on top of one another: the Torah on top, followed by Prophets and Writings; then the siddur, prayer book, since it contains passages from the Torah; then the Talmud, and then other rabbinic writings. Always resting them face up (and flipping them if they are facing down). Never leaving a book open when it is not in use. 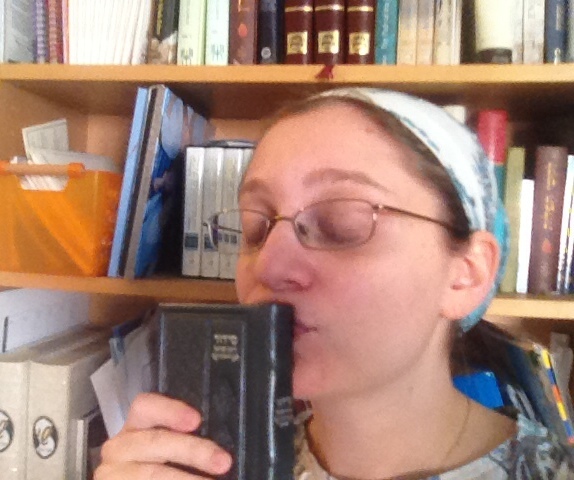 Speaking of kissing things, there is always Phantom Mezuza Syndrome (mentioned in the post about mezuzot), the reflex to reach for the doorpost to kiss a mezuza that isn’t there. 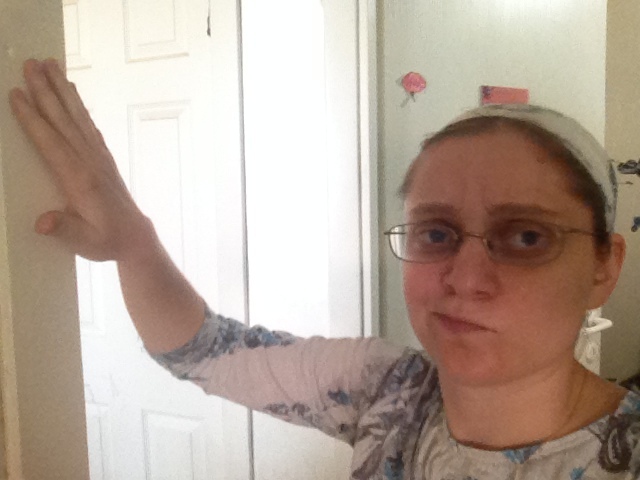 No Jewish doorframes were left mezuza-less in the making of this selfie. When visiting the grave of a loved one, some people leave flowers… we leave rocks. This is an ancient Jewish custom and its origins are unclear. I’ve heard a number of different and interesting explanations. But it’s probably similar to the reason we have gravestones in the first place: because stones are permanent and symbolize the permanence of our memory of the person. Person #1: Could you help me carry this refrigerator? Person #2: Do I look twenty years younger all of the sudden? I am told this is not nearly as common in non-Jewish circles, and I guess that makes sense. Judaism revolves around the home and family, and single people can often feel neither-here-nor-there in the community, so it is considered a great kindness to find a match for them. I think it also makes sense in the context of the “small-town culture” and sense of being one big family. Everybody being in everybody else’s business, and all. 😉 In any case, matching up friends and family is a popular pastime among Jews. And they say that if you make three successful matches, you earn a guaranteed spot in Gan Eden. Bringing joy to a bride and groom is an important commandment. This, combined with the “one big family” thing I keep mentioning, leads to the following scenario: a couple is having a modest wedding. Maybe they don’t have much family around because they are immigrants, or maybe they are very poor. In cases like these, complete strangers will volunteer to come to the wedding and sing and dance (and not partake in the banquet) just to make the event as joyous as possible. Funny anecdote on this one: once Eitan was invited to a wedding at a venue that had several weddings going on at once. He was there as a friend of the bride, but as it was an ultra-Orthodox wedding, the men and women were separate so he was hanging out on the men’s side and dancing and singing with them. At some point in the middle of the wedding he figured out that he was actually at the wrong wedding–and nobody noticed or cared! The one time I was at the Western Wall on Jerusalem Day, I joined several circle dances of perfect strangers: we all threw our backpacks in the middle of the circle, danced around them while singing, and then picked up our backpacks and walked away. One of the great things about circle dancing, as opposed to the stuff that goes on at your typical nightclub, is that it’s really about celebrating together and not about showing off your fancy moves. (The fact that it’s usually gender segregated probably helps.) And if you’re in a crowd of dancing Jews and you reach out your hand for long enough, chances are, someone will take it. If you enjoyed this post, you might enjoy my book, too! Click here to check it out.